For a person to experience the wonderful salvation so freely given to humanity in and through Christ, he or she must exercise faith. Many people profess having faith in God, or faith in Jesus. But do they really have the depth of faith that brings salvation? How does one cultivate faith true, saving faith? One way, and one way only: through the power of God's Word the Bible. Only through a thorough and complete experiental understanding of God's Word can a person develop the level of faith necessary for redemption in the final times. Learn that although faith is a gift given to us by God in and through Jesus Christ, there are steps and procedures (the Science of faith) that must be undertaken in order to fully realize that gift. No man has this faith naturally; it is a gift imparted with the salvation gift-package as the Spirit, through the Word of God, presents God's love and goodness, leading to trust and repentance. 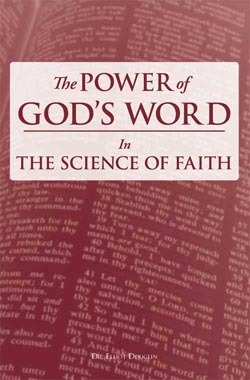 Study with us the true power the necessity of God's Word in the science of faith!